what can you recommend for Sosua hills? if there are combo's to be made with mobile phone subscriptions, that would be fine too. I know claro has some bundles but they work with dishes? Was thinking of that too, just do not know if i have a good connection, still have to test Claro and Orange in those hills. Btw, Tekcom still offering internet services? Anyone knows? 1 ms ping? Unbelievable! Even to their own server. Where exactly in La Mulata? 1 or 2? Keep in mind CLARO is really clueless in this area. I had them for years and was paying for 3 Mb/s downloads. I was always in the 2.X Mb/s range but it was OK. Then one day, the speed fell to around 1 Mb/s while I still paid for 3. Two technician visits and mulitple tech support calls later they told me I was too far from the central station to get more than 1 Mb/s. This after having 3 Mb/s for 10 years with neither me nor the central station moving. I switched to a cable modem and even dropped the local telephone with Claro and now use Vonage world plan which has minutes to DR cell phones and includes DR land lines. Way better than dealing with Claro. 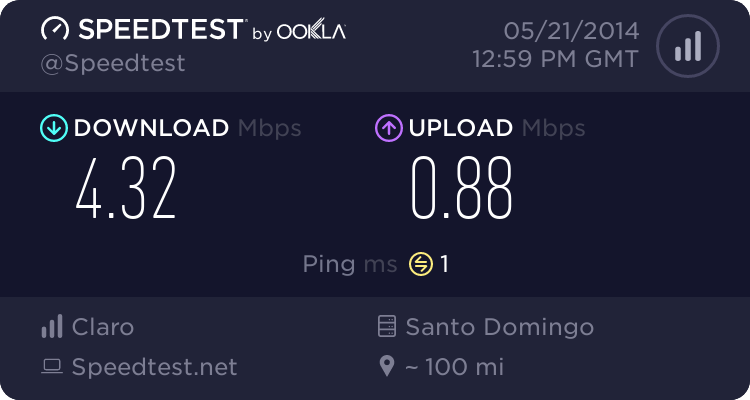 I had many problem to get this speed here, i'm closer to Sosua than you, I think that for el choco is impossible, check for a cable solution, mobil solution is depending the signal strenght and how many use the service at the same time.